SBatch (SLURM code) can be annoying to write and, due to popular demand, I have decided to release some utility scripts I use to auto-generate SLURM. EXC and EXCB are convenience python scripts that allow people to specify jobs and job arrays in simple call files that are then turned into SLURM code and run on the cluster. EXC: You specify a number of CPUs and the command you want run and an sbatch script is automatically generated with the job (from template) and executed. print "USAGE: python exc.py [NUM_CPU] [COMMAND]"
print "ERROR: Only 24 CPUs on a node." EXCB: Same thing but allows you to specify a list of commands in a separate text file. This “jobs” file is then executed as a job array. print "USAGE: python excb.py [NUM_CPU] [JOB_FILE_LIST] [JOB_BATCH_SIZE]"
print "ERROR: Batch size limit exceeded." A lot of people have recently been asking me about help with the SLURM system at UCSD, so I decided to write a blog post to help people quickly learn how to use it and get their jobs running. I have a simple script that can be executed via the sbatch command that forks jobs in a job array. This allows you to run multiple of the same jobs in parallel on the cluster. partition: shared vs. compute. “shared” is generally what people use if you just want to use the cluster for straight-forward jobs. “compute” specifies a more reserved use of the cluster that needs more time (but also costs more). ntasks-per-node: how many tasks there are (in this case, I’m treating this all as 1 task). cpus-per-task: How many cores to use per task in the job array. -o specifies that outputfiles and -e specifies error files. You can just keep these as is for now (and change once you try running it if need be). array=1-3%3 specifies that the job array contains three jobs (i.e. calls.txt has three lines) and %3 specifies they should be run 3 at a time (i.e. all at once). If you have 50 jobs you want to run 10 at a time, the command is array=1-50%10. All the job array script does is step through calls.txt and fork them to the cluster in batches that are specified by the “array” command. Hopefully this makes use of SLURM a lot simpler for everyone. Cheers! 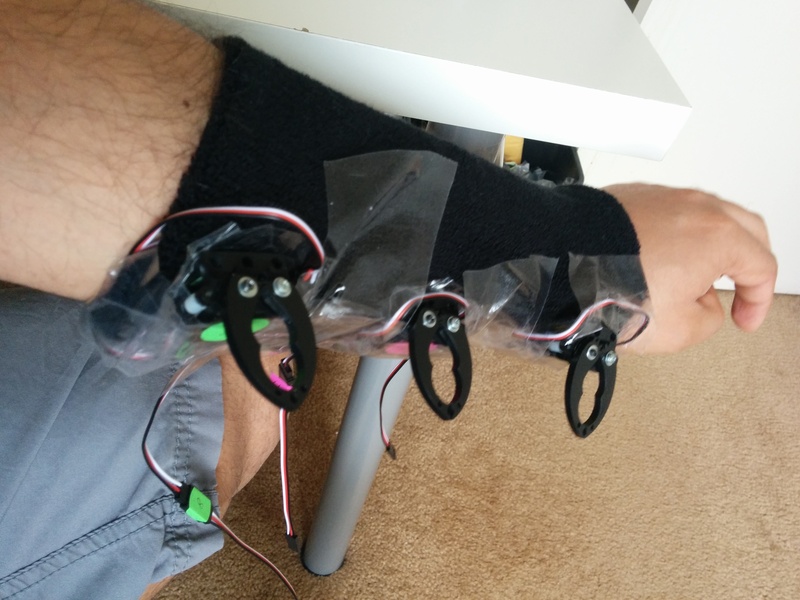 I recently was able to configure my Myoware EMG sensor to work with some of my robot arms. Myoware makes these EMG sensors (https://www.pololu.com/product/2732) that are pretty cool. 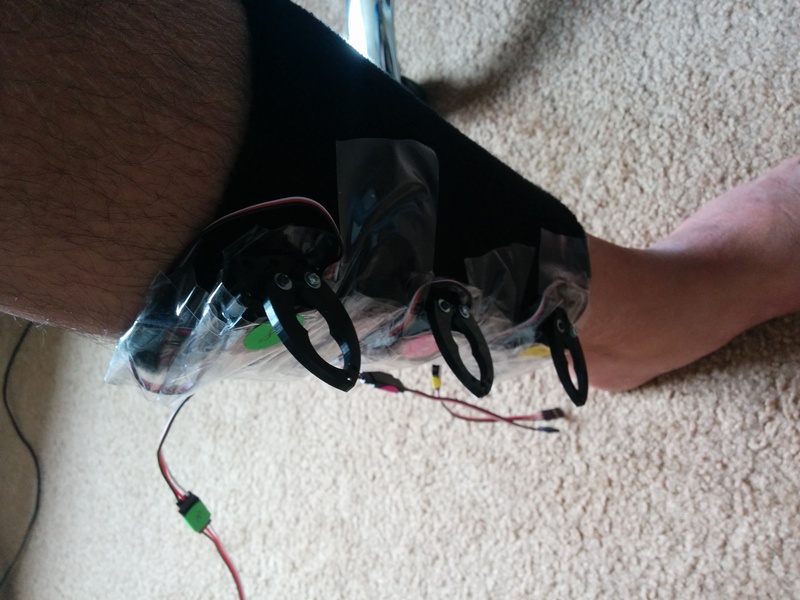 EMG stands for “Electromyography” which detects muscle potentials using conductive electrodes on your skin. Every time you flex your muscles, your motor system sends electrical signals that cause muscles to contract. The EMG sensors can detect these potentials and thus tell when you are flexing your muscles. Also, feel free to check out some of my other recent robotic builds. I will be doing a guest talk at UCSD’s Biorobotics Lab tomorrow Monday March 7 at 9:30AM in EBU II. My talk is titled “Bayesian Aggregation (and crazy side projects).” Her are the slides. I discuss my thesis work on Bayesian sensor fusion methods to understand information sources from multiple noisy observations, as well as show some multi-robot cyborg videos! Come if you’re around campus! 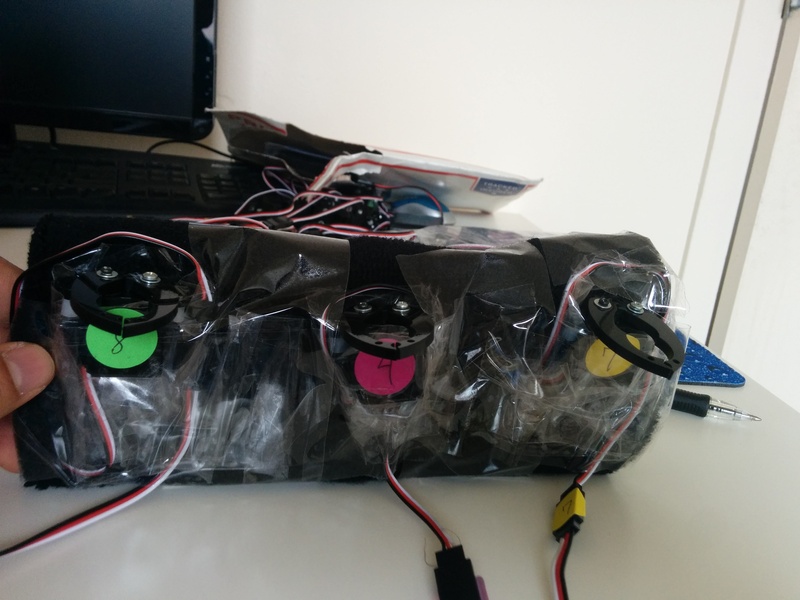 Autonomous Robot Helper Backpack Featured! 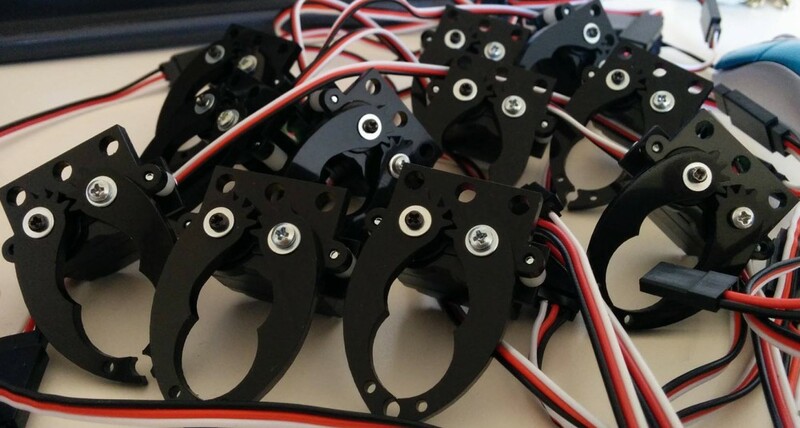 The Robot Helper Backpack Project has been getting tons of press recently. A big thanks to all the sponsoring/supporting entities and readers for your ongoing support of this blog. Instead, it is likely that the multi-robot cyborg systems will do some useful stuff for us, making the world a much better place to live. The slide-on SmartClaw can go anywhere you need a couple helping hands. Perhaps you’d like to carry some additional items on your arm. You can also wear it on your feet if you so desire. The hardware and software is highly scalable and cost-effective. The proto-electronics used are the Pololu Micro Maestro Controller ($20), the Raspberry Pi ($35), along with some batteries. The grippers are mounted on inexpensive ($5) wristbands. The Python software runs on the Raspberry Pi and currently allows control with Android devices (though we’d like to add additional sensors and build some autonomy). Multiple robots augmenting a human? That sounds crazy! Be assured — there are many useful real-world applications for the upcoming world of multi robot cyborgs. 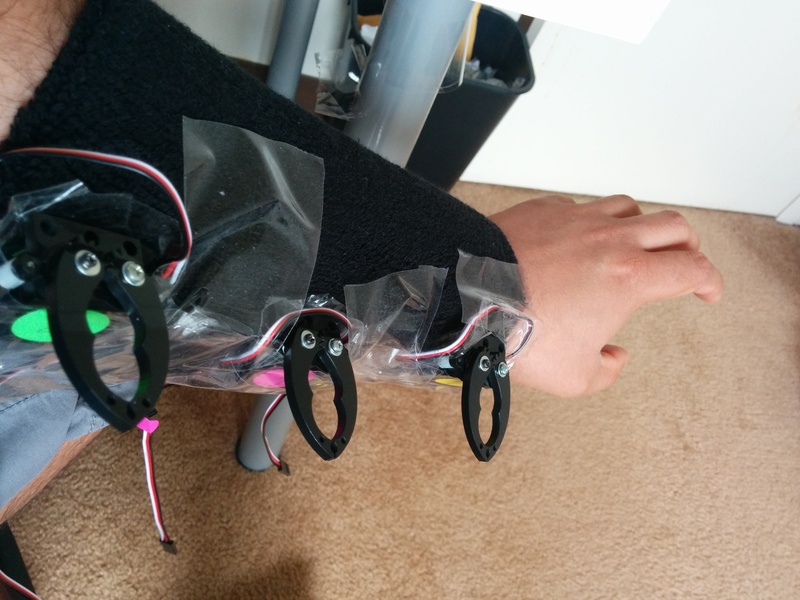 In Medicine: Why do prosthetics only have to provide one robot arm? Like pasta, more is always better! Even if you just broke a bone or have a sprain, wouldn’t it be nice to have a smart cast that provides temporary capability to manipulate the world while you heal? Slide-on Multi-Claws can enable you to do more with much more. In Fashion: Multi-robot cyborg attire is highly highly fashionable. This fact is not contestable. For everyone: With multiple robots augmenting a human, you can have more degrees of freedom than ever before. Systems can be designed in such a way that they are noninvasive. It’s like any other type of clothing. If you don’t want it anymore, you can simply take it off. Maybe, though, you’ll even want to keep the extra arms just for the sheer power of manipulating the world at your will! …And the best part is there are many more where this came from. I took part in a small, side liberal arts program while doing my engineering degree at USC. While I do buy the “technology and people” defense of a liberal arts education, I think it is possible to argue something more fundamental. I think the idea that there is some distinction at the pure idea level between different academic subjects is false. In data engineering, for instance, people seem to really really underestimate the creativity involved in coming up with different weighting rules, interpolation strategies, etc. How you choose and set very basic parameters in a signal processing system is very important. Deep down this has been treated as a question of fitting rules to groups of data points vs. the individual (statistically, a “bias-variance” tradeoff), which is more of a classical liberal arts question. You could say very similar things about systems engineering. Many good engineers believe that organizing and structuring your system can be as much of an art as a science. Building a circuit or software system elegantly may allow the system diagrams to look nice, but also for it work better and have fewer bugs when you go to test it. It’s no accident that some of the best computer vision algorithms today make use of ideas from pointillism, or that Bayesianism lies at the root of some of the most powerful data analytic systems. Being able to manipulate these ideas at will is what advances engineering: building new systems. There are countless examples of some of the most powerful engineering frameworks being influenced by earlier ideas in other fields. Game theory (a theory of economics) is at the current state of the art of network optimization, building power management, and multi-robot coordination. The same framework is being used to understand bacteria growth and counter possible bacterial resistance to antibiotics. “Technical skills” and “scientific thinking” are often parameterized by deeper philosophical ideas that have their original basis in liberal arts. One could even make the stronger claim that often times “technical skills” are no more than a wrapper and packaging of much deeper original ideas. “Scientific thinking” is not about cleaning test tubes but about the much harder problems of hypothesis generation and the interpretation of experiments which have their treatment in scientific philosophy. None of the arguments I’ve advanced has anything to do with technology’s application to society or people, which I think is the weaker defense of liberal arts with respect to STEM. That rhetoric serves more to convert from engineering to business, and gives credence to the erroneous idea that people should move from developing fundamental technology (“the engineering problem”) to simply applying already created technology to society (“the business problem”). As an engineer, I am not a fan. A common advocacy is to change STEM to STEAM to include the arts. From a “pure engineering” perspective, I would say STEAM is a redundant acronym — STEM is technically STEM(A), an unfactorable function of liberal arts.